She is a former golf professional and has worked as a trainer and coach for over 20 years. She has been seen in the magazine Svensk Golf with over 495 000 subscribers/month as one of the trainers and in the page called “Toppform”. Jenny has also worked as a CEO and Marketing Manager within the business world and today she is a lecturer and work as a mental trainer, coach and physical trainer within sports-and leadership. Jenny also run the podcast “Sports-and leadership podcast” or in Swedish “Idrott-och ledarskapspodden” where you can find many profiles such as Lars-Eric Uneståhl, Igor Ardoris and Yamina Enedahl who are also speakers at this World congress. 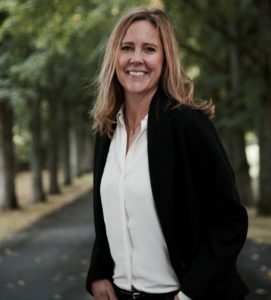 These profiles are also some of the guestwriters in Jenny’s newly released book “Stolt, stark & säker – a book about integrated training for golfers”. Jenny combines and integrate her education and experience from the business world and the sports world in her training and to balance it all she uses her knowledge as a MediYoga and Mindfulness instructor in order to develop abilities and to train both mind and body with her clients. Jenny works in a health center in Stockholm. As a former golfprofessional I am used to work with obstacles or hazards that stands in the way between me and the green and the goal of my golfball – to make it into the hole in as few shots as possible. Obstacles can be a waterhazard, an out of bound stake (marks the border of the golfcourse), a bunker or a forest among other hazards. If you hit them you lose one or two shots which is a problem since you want as few shots as possible when you play golf. So, you need to train your brain and body to know where you WANT to land the ball and not where you DON’T want to land the ball. The interesting part is that since the hazards has a strong ability to get your attention, especially since they might be connected to some sort of fear that you have, they will do anything to draw your attention to them. The feeling of fear that can get your attention could be: “If I hit the hazard I can lose the competition”, “Fear of what everyone will think if I don’t score well” “You might think that If I don’t play well, my sponsors will leave me!” Etc. etc. Your mind can create many dramas when you think about hazards and let your fear steer you. The funny thing is that even if you intellectually know that the hazard is only a hazard and that it is not about life or death, your body can act as if it is. Your stress system activates and reacts to your fear and it will be impossible to hit a good shot. The same thing can happen at your work, or in any other situation where hazards and fear get’s into the picture. Here the fear could be “What if I don’t turn in my report in time, I might get fired”, “When are they going to find out that I am a fake (the Impostor phenomenon)”, “An email from your boss saying he/she wants to see you” etc. etc. So how do we deal with obstacles/hazards and what can we do to get thru, over or under them? This is what I wanted to focus on during this workshop and I hope you would like to join me.